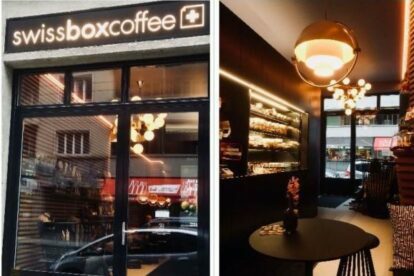 So, I revealed my Sunday morning hangout in a previous article (it is Chou), it is now time to introduce you to my Saturday morning place to hide: Swissbox. I have to admit that I am a bit obsessed with coffee shops, probably due to the years spent in the USA as a law school student. Luckily, Geneva’s coffee shop scene, which was once scarce, is now rich of cute places to read a book at and enjoy a perfect cappuccino. Swissbox is a great new addition to the Eaux-Vives neighborhood. It has a modern vibe in its design, but a Swiss traditional soul. In fact, all the food and beverages are locally produced and sourced in Switzerland, which is another great reason to love Swissbox. The service is friendly, attentive but not overbearing. The owners put a lot of thought, love and humor in creating this lovely space. I love that their freshly squeezed juices have funky names such as “Pressé comme un citron” (*squeezed like a lemon) or “Orange Mécanique”. And what a pleasant surprise — once you finish your tasty latte, the mug says “hello beautiful”. This place will put you on a good mood, especially on a rainy day!